The NRA Instructor Basic Rifle course is what is referred to as a discipline course. You must have completed and passed the NRA Basic Instructor Training (BIT) prior to taking a discipline. Upon completion of this discipline the Instructor candidate will be able to conduct and instruct two NRA firearm course disciplines and with FIRST Steps could be as many as seven different courses. Training Counselors will evaluate candidates’ performance based on their ability to handle the firearms with confidence, use of appropriate training aids, following the lesson plans and meeting all learning objectives, while utilizing the teaching philosophies learned during the BIT. Candidates can also expect to learn the NRA discipline specific instructional methods and evaluating and improving the performance of beginning shooters. 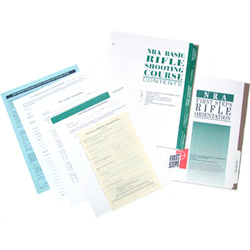 Candidates will be provided with the NRA Trainer’s Guide, appropriate Lesson Plans and Outlines, Basic Course Student handbooks, certificates, basic student examinations, Winchester/NRA Marksmanship Qualification Program booklet, Basic Firearm Training Programs Brochure, Gun Safety Rules brochure, NRA Trainer’s Examination and NRA discipline specific instructor examination (minimum passing grade is 90%). The NRA Instructor Basic Rifle course teaches the basic knowledge, skills, and attitude for owning and operating a Rifle safely. continued opportunities for skill development.